Back with the Blogging Marathon (BM) this week with No Fire Cooking. When Valli announced BM#8, I jumped at this theme as I was planning to get my 6 year old to get me to help put together her own breakfast and some snacks for some time now . Kids , especially girls I guess have this insatiable curiousity with the kitchen and they want to help out carrying out small chores in the kitchen. With BM and through this week, I would work along with my daughter and help make and taste small no-cook dishes .. Hope you enjoy this journey as much I am looking forward to it.. 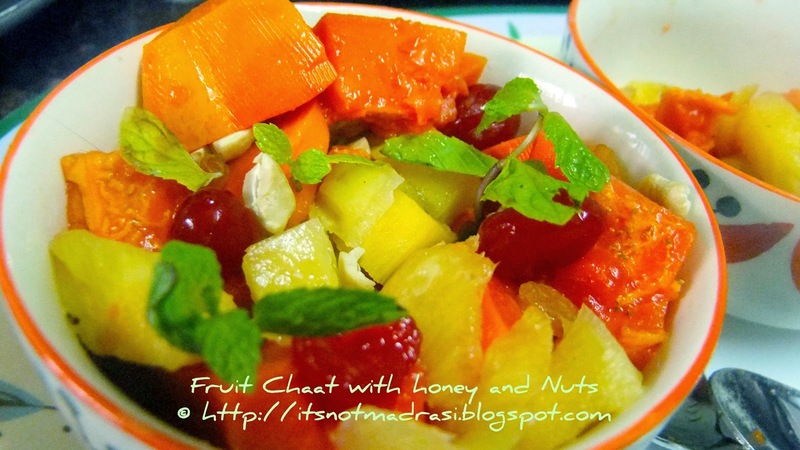 In the first of this series, let's make a simple Fruit Chaat with Honey and Nuts. Well, the best part of this series is it doesn't even need a to - go list and most ingredients can be found easily in any pantry, and you could even substitute one or two of these that suits your palate and kiddo's preferences. I saw this recipe in a magazine recently, and it looksed too good and easy to try it out for the Blogging Marathon. 1) Wash, peel and cut fruits into medium sized chunks. 2) In a small bowl, mix honey, chaat masala well. 3) Pour this dressing over the fruits. 4) Add the chopped nuts and glazed cherries. Garnish with mint leaves. Lovely way to have fruits... colours are awesome:) Yummy breakfast.. Healthy chat.. looks colorful.. Nice to know that ur daughter is helping u..
Thats a colourful,delicious chaat, feel like finishing that bowl..
colorful, healthy, simple and yummy! Looks so very colourful and guess even I planned to do this..now must change the ingredients lol!